The University of Aalborg Study on Daytime Flashing Lights forBicycles. I was pulled over by a cop and given a mechanical ticket (out of date tag). How did he pick me out of the lot of San Mateo Bridge traffic? I was the only one driving the speed limit and attentive. This says an awful lot about the attentiveness of the average driver. I don't mean to disagree with the reason the cop paid attention to you. But I'll raise another possibility. that the cop's computer accessed. purposes. It really does smack of "big brother" or worse. facts, but the data are pretty clear. security" went up by 85%! Republican politician paying for climate change research). those are when they are a rider's only light at night. one. None of the studies cited seem to have tried DRLs on bicycles. rate, minimum effective light brightness and so on. green side lights for 3, 2 and 1 miles. "Ooooo this is a really bright light. It has got to be safe"
(sun up about 05:00) and I was riding on a road with little traffic. it collapse under its own weight. of discussing the merits of a study, what is an acceptable method? and went on to deal with the trivia. 1. Go to the original source. Avoid summary or survey sources. often reveals a hidden agenda. data. Often, they're quite different. pre-selection of participants, and statistical creativity. find a better way to deal with a study or report. produced before blundering further with my guesswork. bicycle lighting was changed to allow flashing lights to be used. possibility of entering a specific market. anything that the client required". lobbying the government without any data at all. 1. Attack the statistical sample. huge sample, a sound methodology, and a provable premise. You can't even claim "risk compensation." However, it is amazing to me that a little flea-watt light makes such a dramatic difference. I frequently encounter people with Knog Frogs and various blinkies that I don't notice until long after seeing the rider. Like John B, I've encountered riders with lights so bright that I see them before the rider, but those are rare cases -- as they should be. Riders should not be mistaken for BNSF locomotives. I want to slap those people. As I understand it, the bicycle mode share in Odense is around 24%. There are lots of cyclists. One wonders why the addition of little flea-watt lights would make the flocks of cyclists more visible during the day. Not saying it ain't so, but it just seems odd. 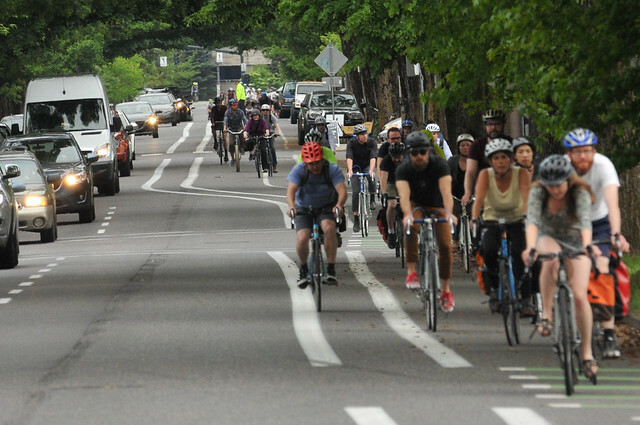 This is a bike commute in Portland: https://farm8.staticflickr.com/7613/...6661f837_z.jpg Gee, I didn't see those ten-thousand riders without lights, officer! On Wed, 22 Mar 2017 14:56:40 +0700, John B.
leave both of them connected? Agreed. I used to work in the advertising and market research sector. I've also been involved in writing "customer satisfaction" surveys. consider purchasing one for all your bicycles? daytime flashing lights on their bicycles? flashing bicycle light and will recommend it to all their friends". that the entire survey assumes that the device works as expected. at its lowest. So, the really important questions are asked last. 4. Attack the data, if there was any manipulation. 5. Attack the conclusions, if they do not relate to the data. 6. Attack the presentation, if it is structured to confuse. 7. Attack the researchers, if they have an obvious agenda. 12. Attack the references, if they are irrelevant, as most are. it apart" and does not constitute an alternative method of argument. not really valid methods of debate and discussion. Alas it's not possible to do any of those three with the Odense study. valid, authoritative, or even useful from just a summary or extract. One needs the original study in order to make claims. A huge sample, a sound methodology, and a provable premise. flashing light reduced crashes by 30% is much the same as my claim.